Renovation requires some exciting decision making. I've been almost obsessively looking at stencil catalogs, for example (I'll get to that post eventually). But this last week has been the worst. 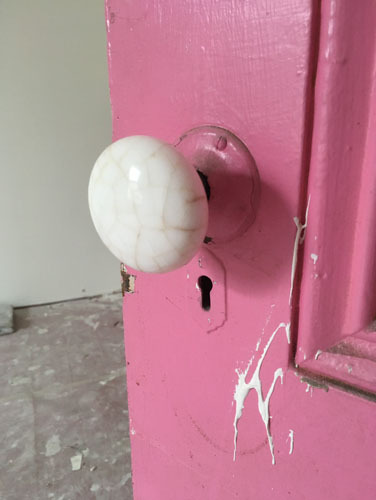 I've been choosing new doorknobs. Also notice that those knobs are on the pocket doors for no good reason. That is extremely unusual. 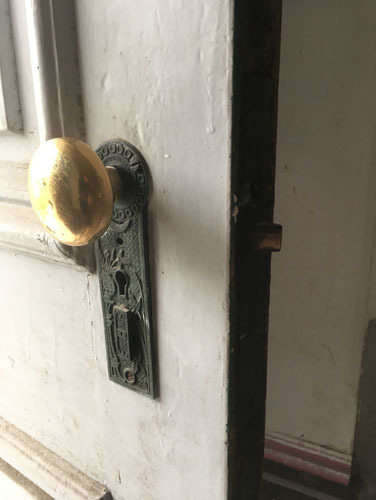 I can't find any pocket door hardware in this style, anywhere. That matters because the crystal knobs are clearly replacements for whatever was originally there (we have no idea what those were). That's a weird amalgam of styles: the bottom lock part is in the Broken Leaf pattern (mid-1880's), the upper rosette is a different pattern (you can see the bottom part is literally cut to fit in place). 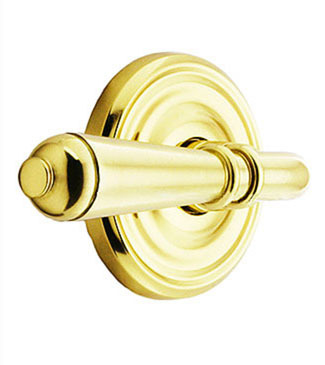 The knob is a basic brass knob that looks much more modern. WTF, previous owners? WTF? So my job for the last week has been finding the right replacement knobs for the old doors, and new knobs for the new doors. I took out a plan and began working on a language. 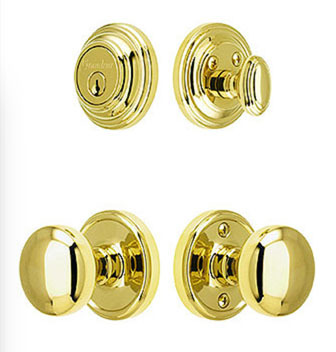 The addition, and any new doors at the back of the house, will have lever handles. We settled on these, which was actually pretty easy. I wanted something fairly simple but with a little traditional feel. They feel really nice, heavy in the right way. So the elevator installation can begin tomorrow. Anyway, that's just the doors at the back of the house. There are... lots of other doors. Including many pocket doors, a few new sets of french doors, and some odd closets that are more like cupboards, such as the new hall closet, the closet above the new hall closet (as I said...) and the high pantry. This language for the doors is getting complicated. 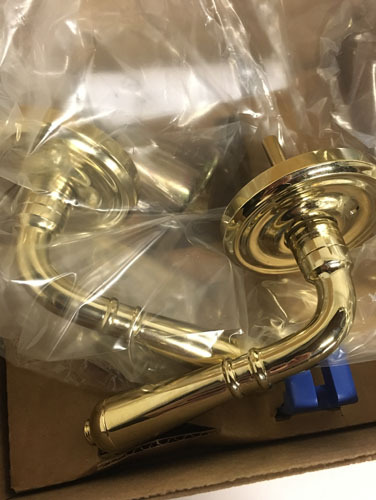 We started with a simple decision, which was to get everything in unlacquered brass. 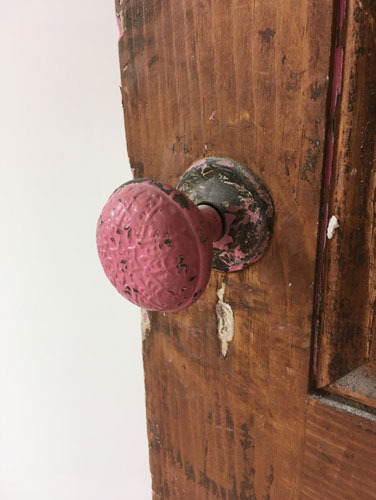 The metal will get a patina over time that will look better than the pre-aged brass finishes, and if we get irritated by that we can spend our weekends polishing doorknobs anxiously. That's close to what was there originally while being both 1) actually operational and 2) not cracked, and 3) not painted over with pink wall paint. 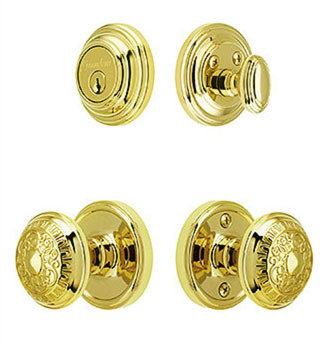 For the new french doors in the parlours (two sets), these crystal knobs. 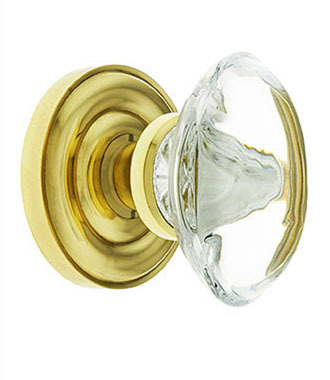 We liked the simpler design of the oval crystal knob. 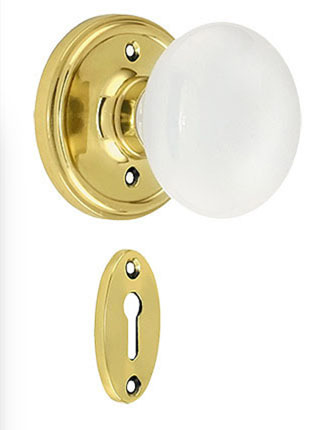 The oval shape is an 1900-ish doorknob design, which puts it a good 25 years after our house was built, but that's a good 75 years younger than the current knobs. We chose this set for the front door after much agonizing. I like the Broken Leaf pattern (as did somebody who lived here before) but could not find an exterior set in it. This is Roanoke, which is an Art Nouveau pattern from 1900-ish. I just had a hard time finding any door sets like this that were less than 25 years younger than the house. Most doors sets I could find had finger-latch handles which are terribly inappropriate. This one looks like it will at least age well and look OK on our door. We are both irrationally excited about a new front door lockset where the knob doesn't randomly fall out in your hands every couple of months. Will we know what to do with ourselves? All evidence says no. On the side door this is where I am right now, but I may go even simpler. 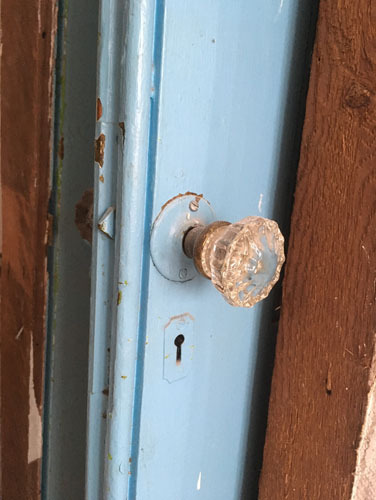 The original side door, which was put in when the house was converted into three units in the Depression, had crappy 1980's hardware on it. Worked OK, opened and closed the door just fine. But nothing to save for future generations (note: in 140 years restorationists will be cursing me for this attitude as they hunt for the perfect intact Home Depot doorknob). Now, that's a few styles of door knobs and I'm not even done with all the doors. Oh, no. What about the doors into the utility spaces in the basement? Should they have a different kind of handle? 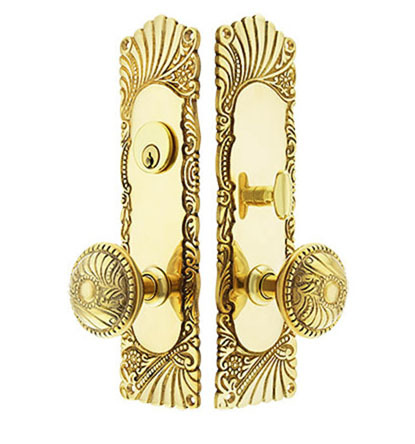 What about the pocket doors: I have pocket doors into bathrooms which need locks, and pocket doors into the pantries and dining room which do not, and the pocket doors in the parlours which need some other kind of hardware altogether. So the next several weeks will be spent making a lot of decisions about hardware. Stay tuned.